In astrology, there are negative and positive yoga. Guru Chandal yoga is one of the negative yoga. The combination of Rahu-Jupiter creates this yoga. However, their vision never creates this yoga. This yoga creates problem in life. This yoga creates more problem if it is in lagan, fifth or ninth house. It affects every good yoga in horoscope, if one cannot do remedy for it. This yoga decreases the auspicious results and increases negative property. It also affects character. One faces digestive and liver problem. It also increases the risk of serious diseases. Sometimes, it becomes the reason of cancer. A person doesn’t follow religion. He gets defamation. If this yoga occurs in woman’s horoscope, then her marital life become hell. 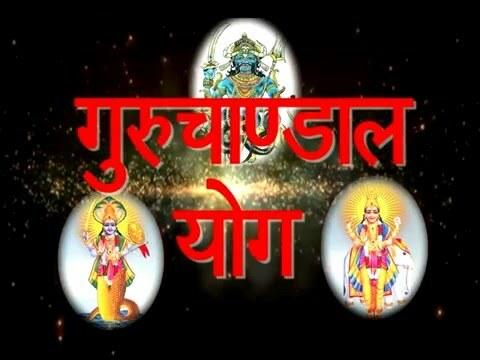 If Jupiter is in high sign or another planet is with Rau-Jupiter then guru Chandal yoga won’t work. If Jupiter is set or retrograde or if you have mercy of an idol then this yoga won’t work. Always give respect to elders. Always visit any religious or temple. Chant Gayatri psalm with turmeric garland for 108 times. Cover your throat with gold or bras square piece. Plant peeple tree on roadside and temple. Avoid having non veg food. Good Luck: Do not keep banana plant near the entrance of home. It increases misfortune.